At 38 weeks, I’ve felt like I’ve had a serious ramp up of hormones. From intense emotions to acid reflux to even looser ligaments, my body feels like it’s not my own. Everything is heightened. Even my (ever more common) Braxton Hicks contractions feel different; like I can feel them in my chest, my nose, and my head before I actually feel my uterus tighten. And headaches. But no swelling (good!). I’ve also experienced a massively increased appetite which, coupled with the increased acid reflux, isn’t going over well. Finally, I’m feeling really exhausted; but I also have difficulty sleeping because of the belly and the acid reflux. It’s a pretty crazy time period. I understand why women usually are ready to be done done done with pregnancy in their last month! It’s HARD WORK!! The kid is still getting daily hiccups, so I guess his or her lungs are not yet ready to breath oxygen “out here.” I read online this week that when the baby’s lungs are ready, they secrete a hormone that triggers the elevated oxytocin levels that begin actual labour! Isn’t that amazing!? At 38 weeks, my appetite has increased (as I mentioned above), but I’m not really able to eat more because so has my acid reflux! I’m just eating more often, but smaller meals. It’s so weird. Before I was pregnant, I really subscribed to the “Mastering Leptin” strategy of eating that helps to control hormone regulation: eat three balanced meals a day and Do. Not. Snack. But now snacking is so much a part of my routine. 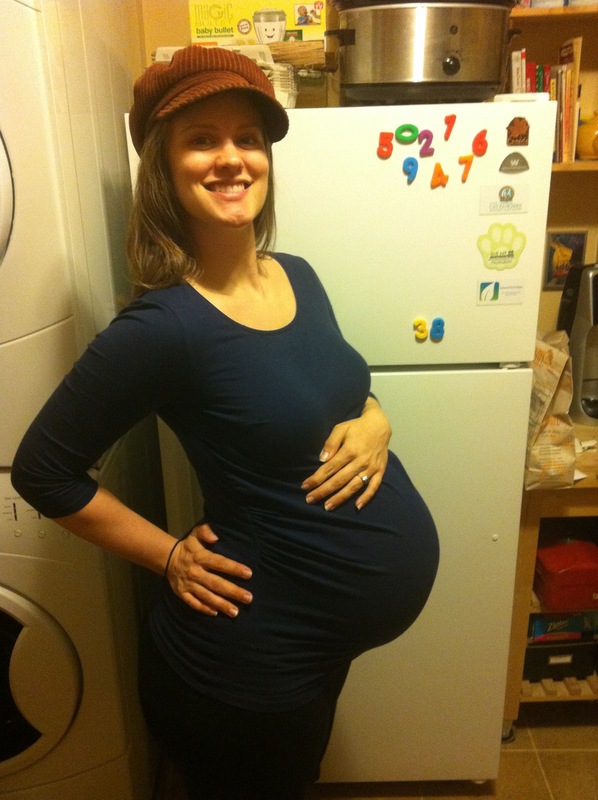 Once I deliver this babe, I plan to go back to the do-not-snack plan because it really does help me maintain hormone regulation (which helps maintain my health and body-fat-percentage); but for now, I just need to keep eating whole, real foods because my hormones are doing their own thing with the pregnancy. Right? I’d stopped eating the organ meats a few weeks ago and I’m wondering if that was a mistake. I didn’t do it on purpose. I just started choosing other meats. I still have two pounds left in the fridge. I plan to gobble up both of them before my due date (and I have more arriving in the mail). I think that perhaps the recent appearance of mild stretch marks is a result of having halted my organ-meat consumption. Also, there are some who theorize that the presence of stretch marks is a predictor of perineal tearing; however, there are plenty of examples of women who didn’t have any stretch marks and tore horribly and women who had lots of stretch marks and didn’t tear at all. Either way, I plan to continue to do what I can to nourish myself and my skin. Supplements I’m still taking: Vitamin C, enzymes, probiotics, vitamin D, Cod Liver Oil/Butter Oil capsules. I stopped taking magnesium (not sure why). I’m really happy with my row time. I was taking it easy and going for long strokes and longer recovery time. Amazingly, I stayed at about 29 spm. My 1RM for Power Cleans is 110. I achieved this at about 17 weeks preggie (Nov 1). So obviously I kept these lighter than Rx. But I did more sets. I was also curious, because of OneFitMom’s comment last week, how straight my bar path is. So I set up my iPhone and shot two videos. Enjoy! On the first met-con, I obviously scaled way down. There’s no way I can do 75% of my body weight. Also, I think I’m done with pull-ups until after I give birth just because of clumsiness and awkwardness and the looseness of my ligaments! Ring rows were much better. Finally, GHD sit-ups. … Yeah. Coach Iz and I decided last week that I’m done with ball slams. And I’ve been done with double-unders for a while now. So why get complicated? So for the second met-con, I just decided on an easy couplet. That said, the ring push-ups were definitely harder than I’d anticipated. Both because I haven’t done push-ups in a while and because my ligaments are looser now! Yes, the Row was only 7 rounds. I mis-programed my rower. Oops! And those box squats were slow as molasses, eh? I decided to do box squats to save my round ligaments from potential pain. Still amazed at how slow I went. My previous PR for Hang Cleans was 60# back in September (I was about 9 weeks preggie). It was a fun class. I felt tired at the end of the day; but good tired. Here’s a picture from 38 weeks! Gilliebean at 38 Weeks Preggie! This entry was posted on Monday, April 2nd, 2012 at 8:35 am and is filed under preggie. You can follow any responses to this entry through the RSS 2.0 feed. You can leave a response, or trackback from your own site. I keep checking back to see if you’ve had the baby yet. The full moon definitely didn’t work for me. I was already overdue and it did nothing, lol.